Background: It has been demonstrated that performing a mock embryo transfer (ET) significantly improves the pregnancy rate in IVF cycles. The mock ET could be performed prior to the stimulation cycle or immediately before real ET. The problem of the first procedure is the possibility of variation in the uterine position and or cervico–uterine angle. Objective: The purpose of this study was to determine the consistency of the type of ET in mock ET prior to the treatment cycle with real ET. 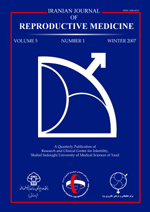 Materials and Methods: A prospective comparison between the technique of mock embryo transfer and real embryo transfer. One hundred and sixty treatment cycles on 141 patients between January 2003 and September 2004 ended to ET and they were analyzed prospectively. In each cycle, patients underwent a mock ET in mid luteal phase prior to treatment cycle (the date when patients referred to have consultation about down regulation regimen). Results: Of 160 mock ET the Wallace catheter passed easily in 144 (90%) of them. In the remaining 16 cycles (10%) a tenaculum and or a rigid cannula had to be used. From 144 cases of easy mock ET, real ET was easy in 121 (84%) cases while 23 (16%) cases had difficultly during real ET. In the 16 cases of difficult mock ET, there was 8 cases (50%) of difficult real ET and 8 cases (50%) of easy real ET (p=0.001, χ2=10.67). The overall clinical pregnancy rate for both difficult and easy transfer was 35%. ‏The pregnancy rate for easy real ET was 37.2% and for difficult real ET was 25.87%. Despite of the difference, the statistical analysis shows no significance difference (χ2=1.21). The difference between mean age for both difficult and easy real transfer was not significant. Conclusion: Mock ET before beginning of the treatment cycle is highly consistent with real ET.